ELVIS HAS LEFT THE BUILDING!  Hepworth 2005. Is death the end? 'Man is mortal and death is the end'. All people die – this is the law of nature. Known. 2 Is death the end? 'Man is mortal and death is the end'. All people die – this is the law of nature. Known as 'The King', Elvis Presley was a singer who had millions of fans across the world during his career which spanned the 1950s to 1970s. 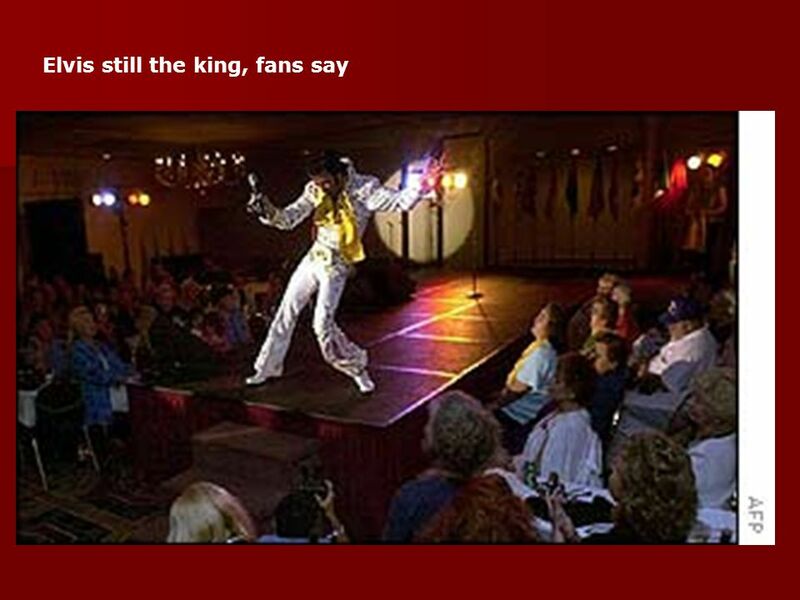 So why should there be questions about the death of Elvis? He was after all - despite his enormous talent - just a man. 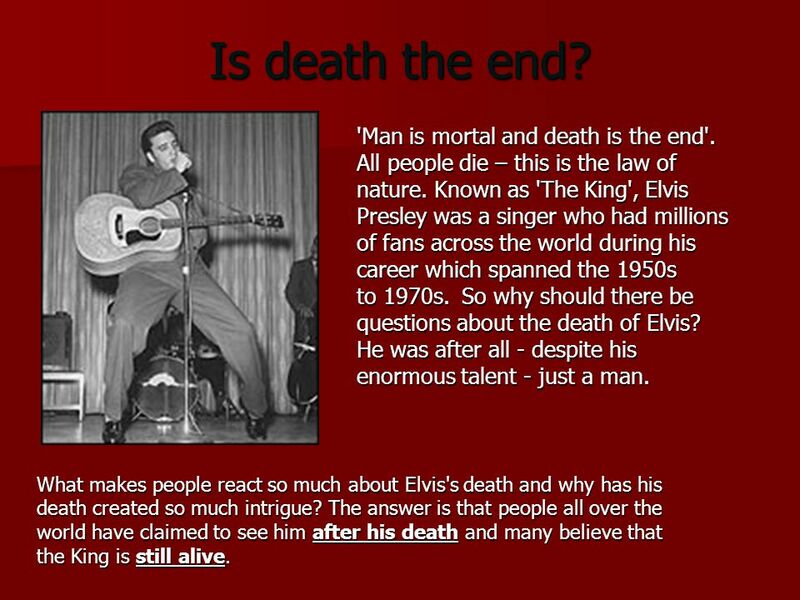 What makes people react so much about Elvis's death and why has his death created so much intrigue? 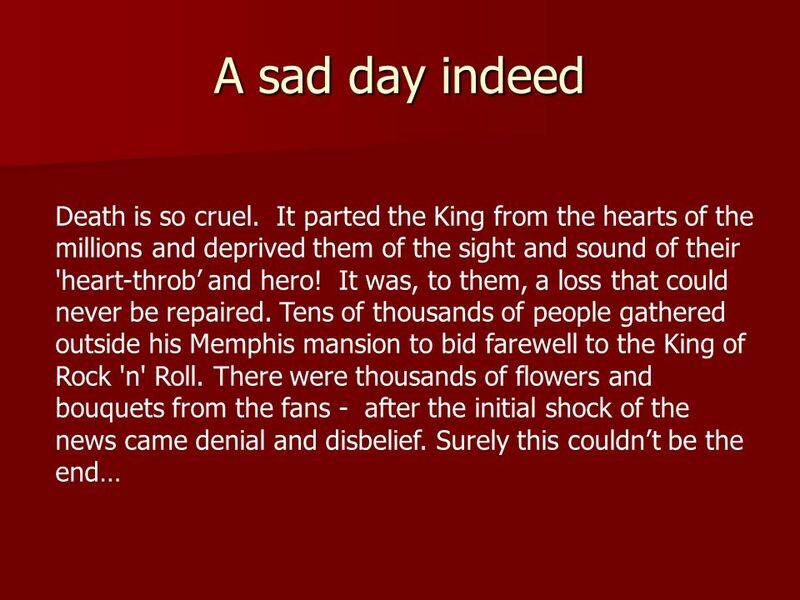 The answer is that people all over the world have claimed to see him after his death and many believe that the King is still alive. 4 The King is dead! 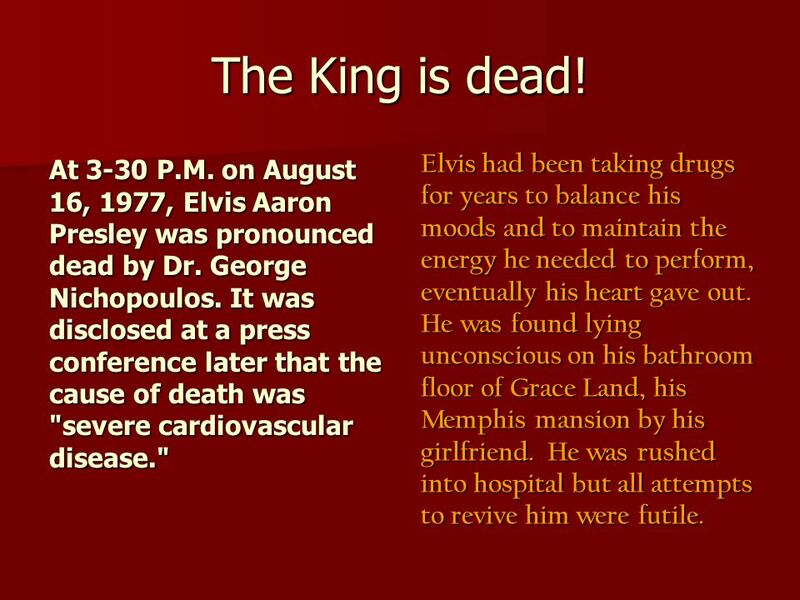 At 3-30 P.M. on August 16, 1977, Elvis Aaron Presley was pronounced dead by Dr. George Nichopoulos. It was disclosed at a press conference later that the cause of death was "severe cardiovascular disease." Elvis had been taking drugs for years to balance his moods and to maintain the energy he needed to perform, eventually his heart gave out. He was found lying unconscious on his bathroom floor of Grace Land, his Memphis mansion by his girlfriend. He was rushed into hospital but all attempts to revive him were futile. 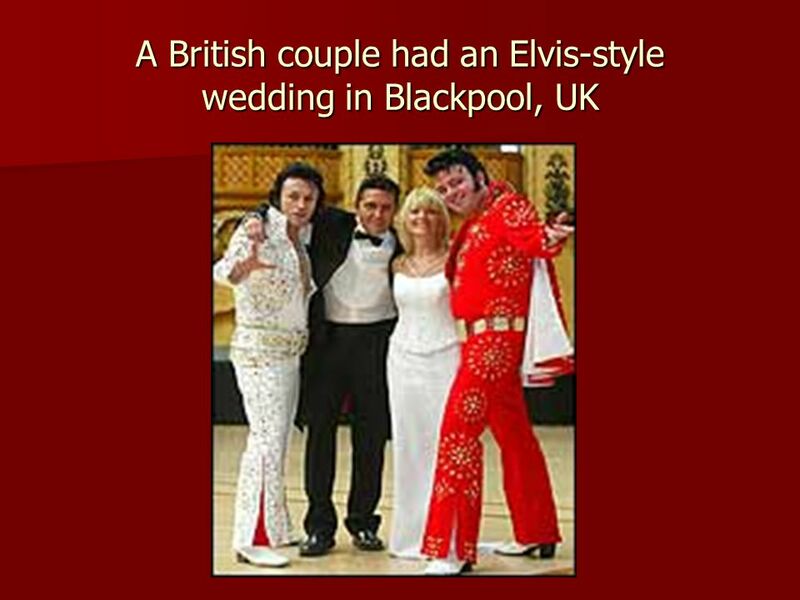 6 Shock / Disbelief The pronouncement was final Elvis was dead. 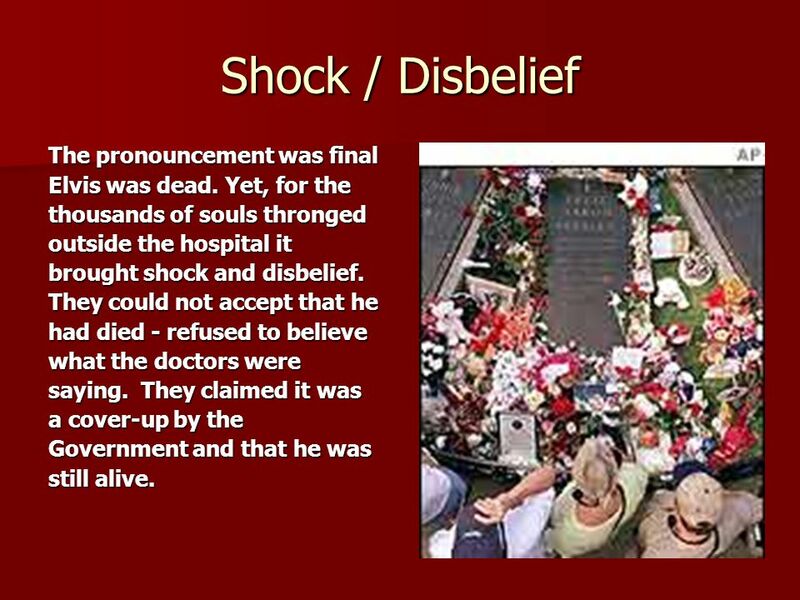 Yet, for the thousands of souls thronged outside the hospital it brought shock and disbelief. They could not accept that he had died - refused to believe what the doctors were saying. They claimed it was a cover-up by the Government and that he was still alive. 7 In 1956, when Presley came crackling out of every radio and speaker in the land, young Americans notions about independence -- from parents, from religion, from the values of the time -- were forming. 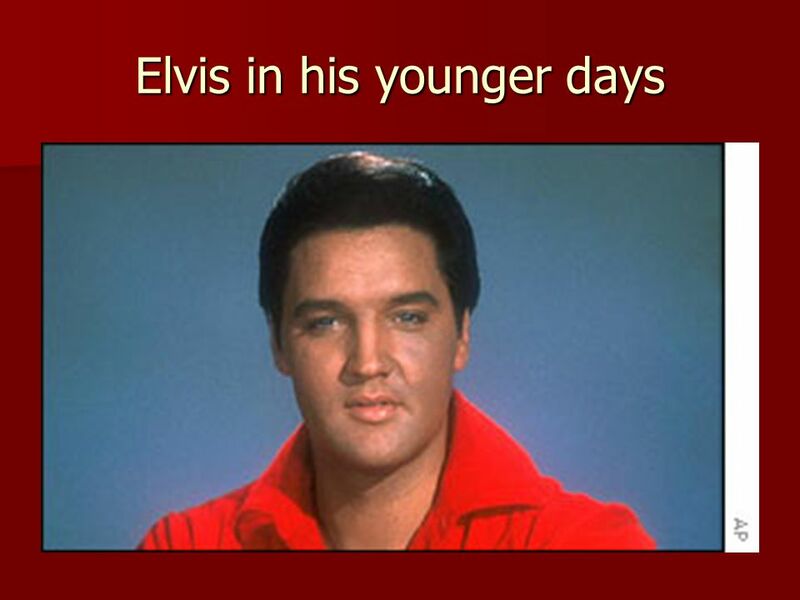 Elvis became "The King" of rock 'n‘ roll, but also of the emerging youth culture. He was a young, hip-thrusting, white singing music that was essentially black. Part of his attraction was that the '50s teenagers viewed him as epitomizing everything they thought their parents feared they would become -- cocky, slick, brash, tough, black-leatherclad, motorcycle straddling, stiletto-shoed. 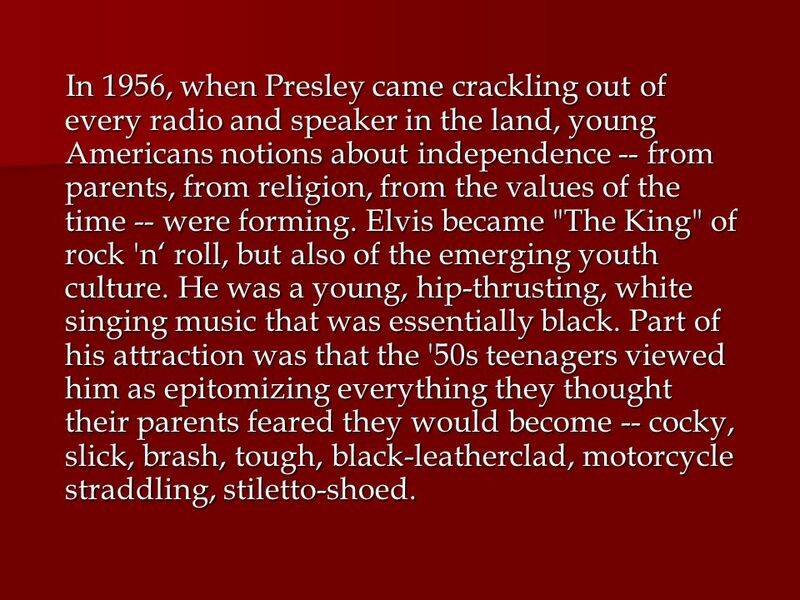 In 1956, when Presley came crackling out of every radio and speaker in the land, young Americans notions about independence -- from parents, from religion, from the values of the time -- were forming. 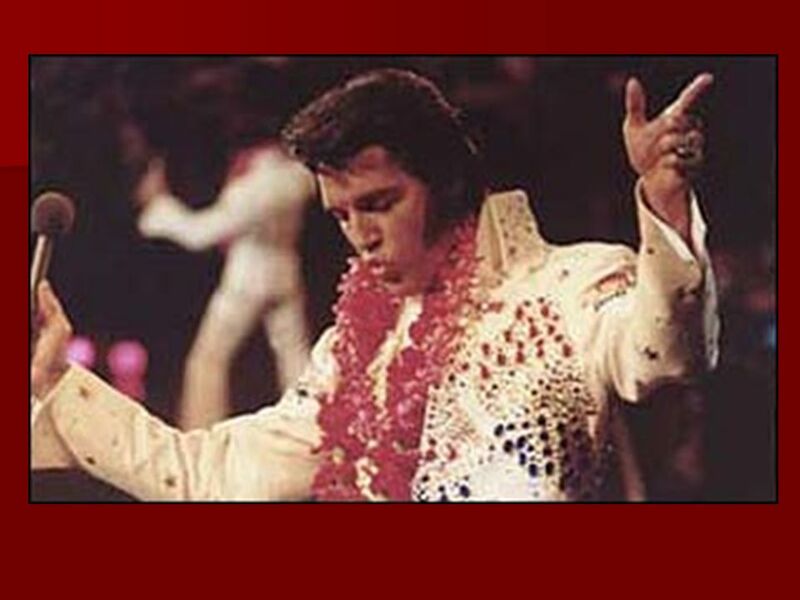 Elvis became "The King" of rock 'n‘ roll, but also of the emerging youth culture. He was a young, hip-thrusting, white singing music that was essentially black. Part of his attraction was that the '50s teenagers viewed him as epitomizing everything they thought their parents feared they would become -- cocky, slick, brash, tough, black-leatherclad, motorcycle straddling, stiletto-shoed. 8 Denial This disbelief is still being nurtured by many across the world today. Fans cannot believe that death brought such an abrupt end to their so beloved idol - a man of remarkable talent who gave so much to so many. 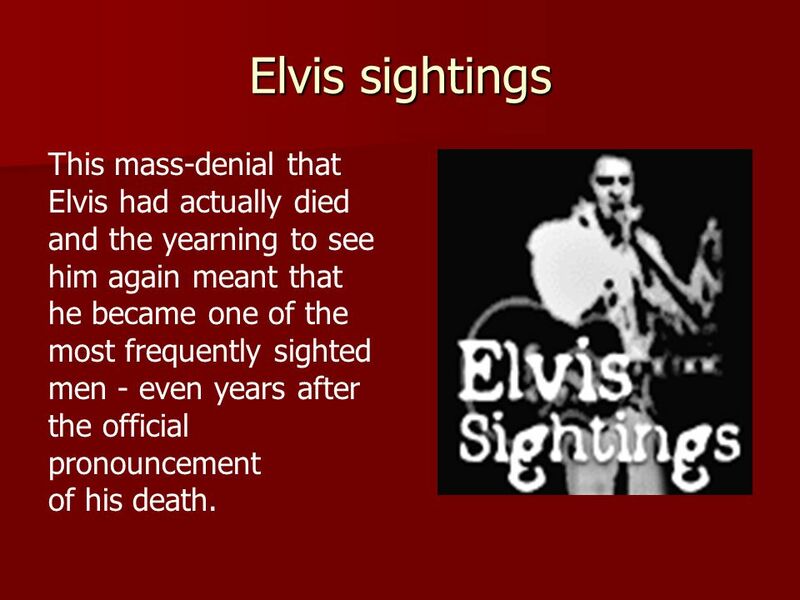 10 Elvis sightings This mass-denial that Elvis had actually died and the yearning to see him again meant that he became one of the most frequently sighted men - even years after the official pronouncement of his death. 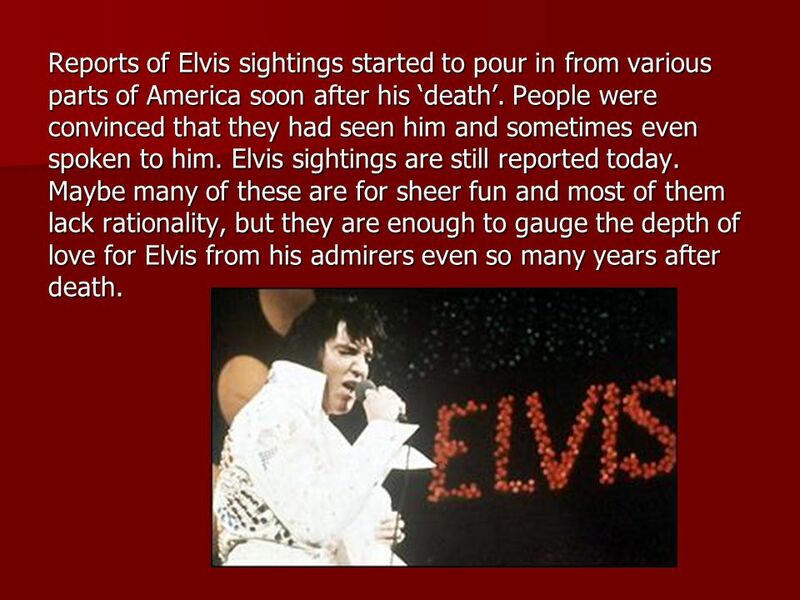 11 Reports of Elvis sightings started to pour in from various parts of America soon after his ‘death’. People were convinced that they had seen him and sometimes even spoken to him. 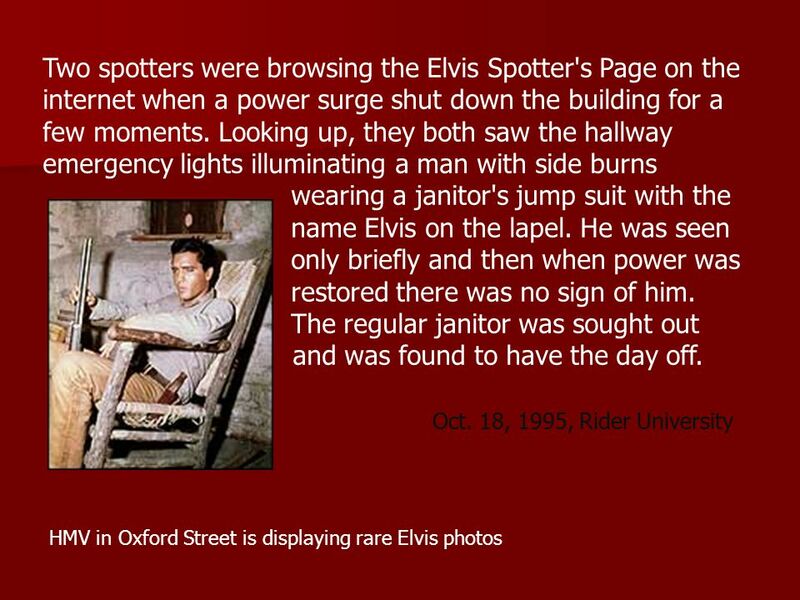 Elvis sightings are still reported today. 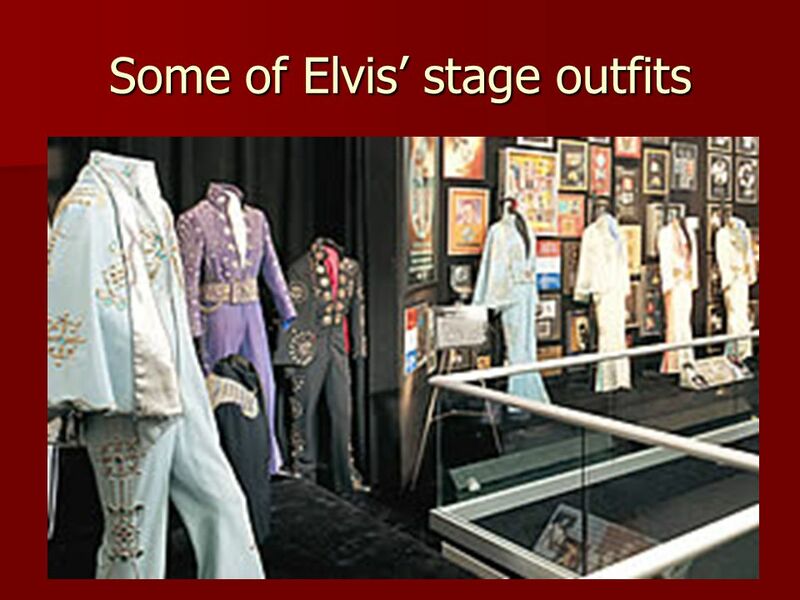 Maybe many of these are for sheer fun and most of them lack rationality, but they are enough to gauge the depth of love for Elvis from his admirers even so many years after death. 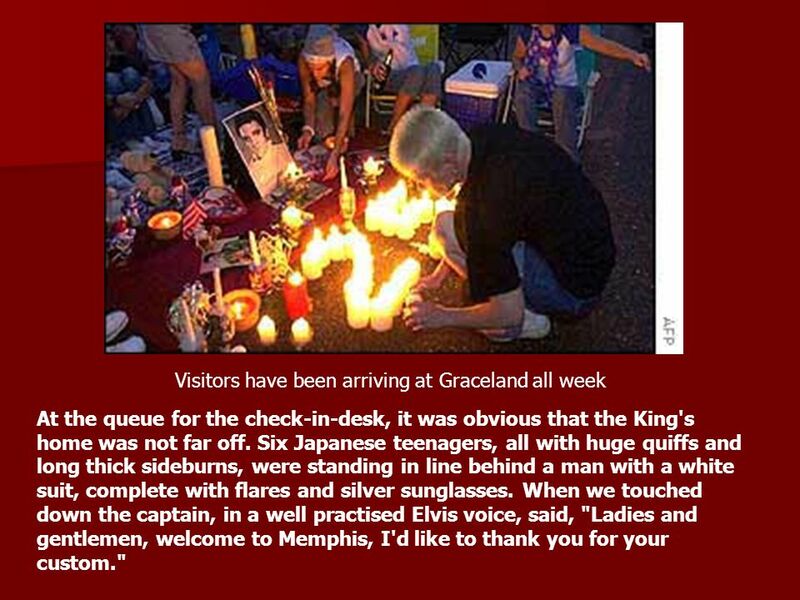 18 Visitors have been arriving at Graceland all week At the queue for the check-in-desk, it was obvious that the King's home was not far off. 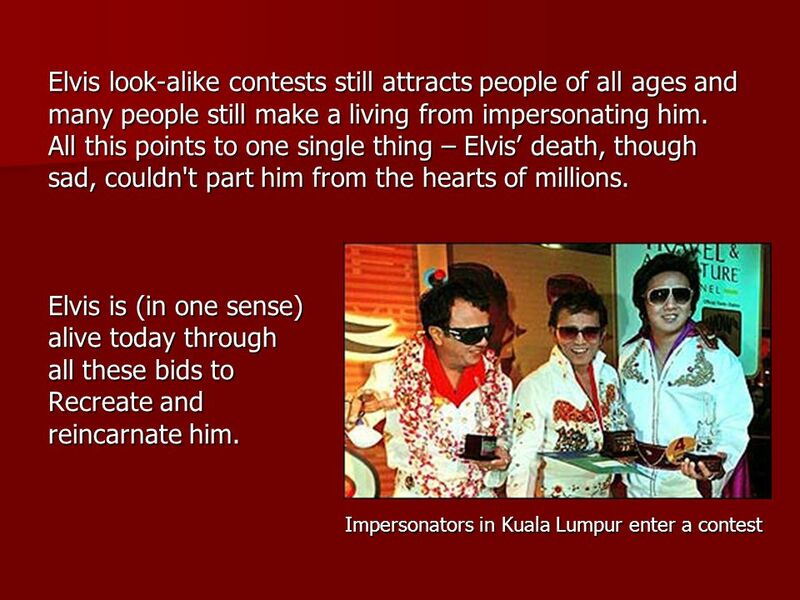 Six Japanese teenagers, all with huge quiffs and long thick sideburns, were standing in line behind a man with a white suit, complete with flares and silver sunglasses. When we touched down the captain, in a well practised Elvis voice, said, "Ladies and gentlemen, welcome to Memphis, I'd like to thank you for your custom." 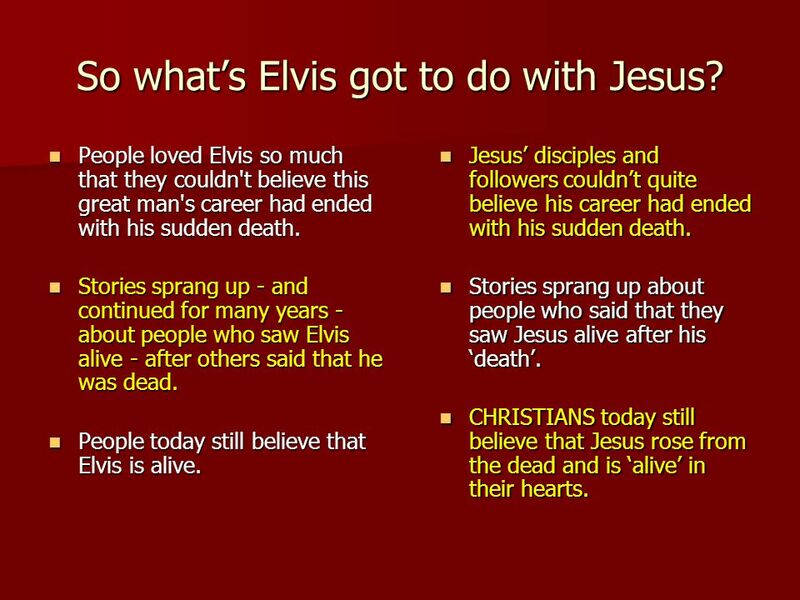 20 So what’s Elvis got to do with Jesus? 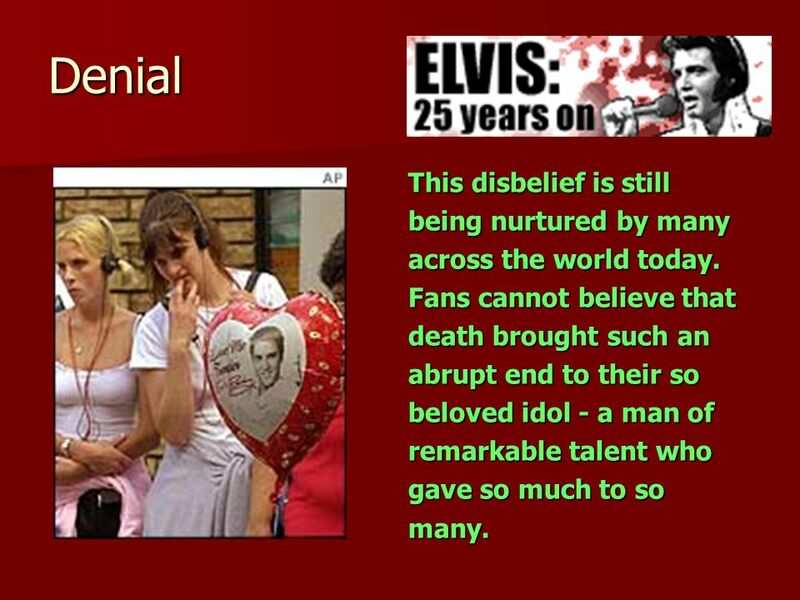 People loved Elvis so much that they couldn't believe this great man's career had ended with his sudden death. 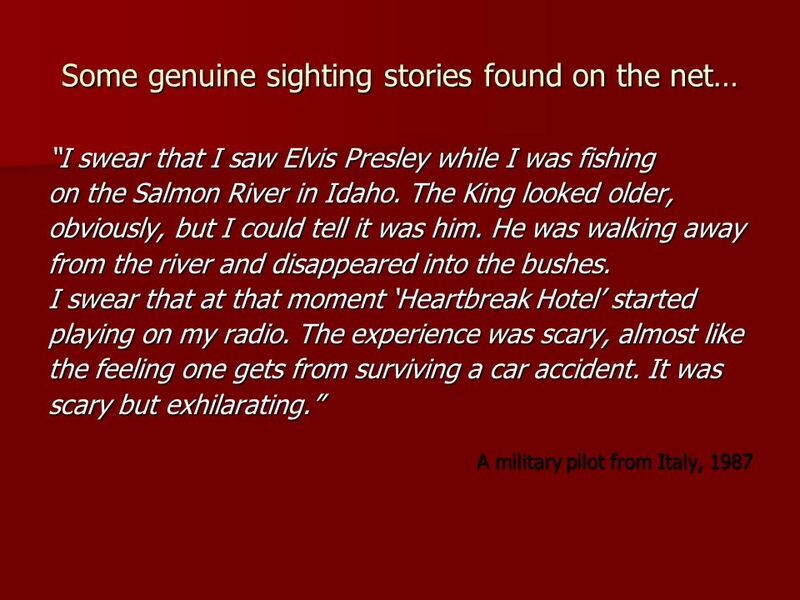 Stories sprang up - and continued for many years - about people who saw Elvis alive - after others said that he was dead. 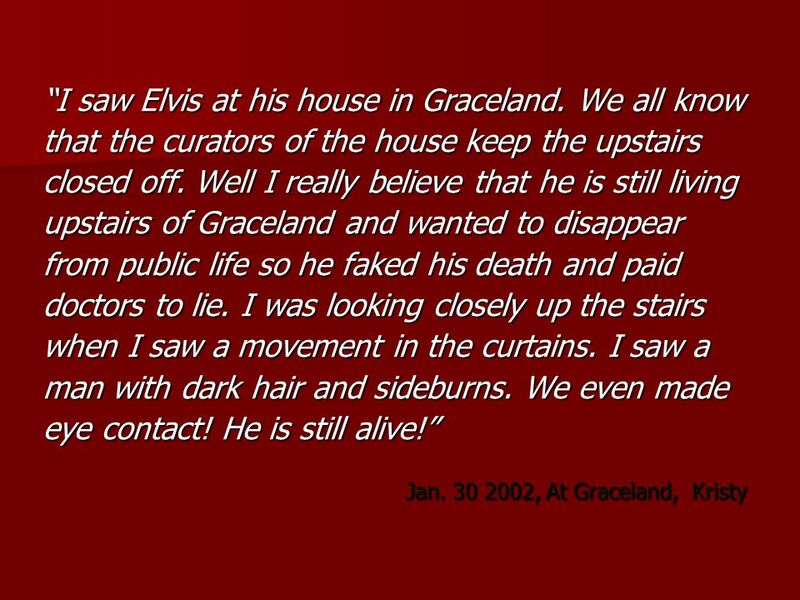 People today still believe that Elvis is alive. Jesus’ disciples and followers couldn’t quite believe his career had ended with his sudden death. Stories sprang up about people who said that they saw Jesus alive after his ‘death’. 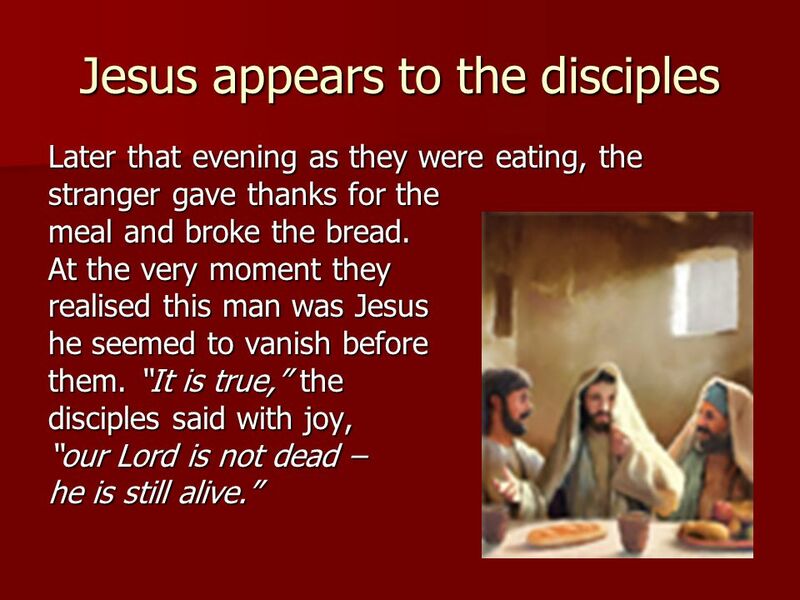 CHRISTIANS today still believe that Jesus rose from the dead and is ‘alive’ in their hearts. 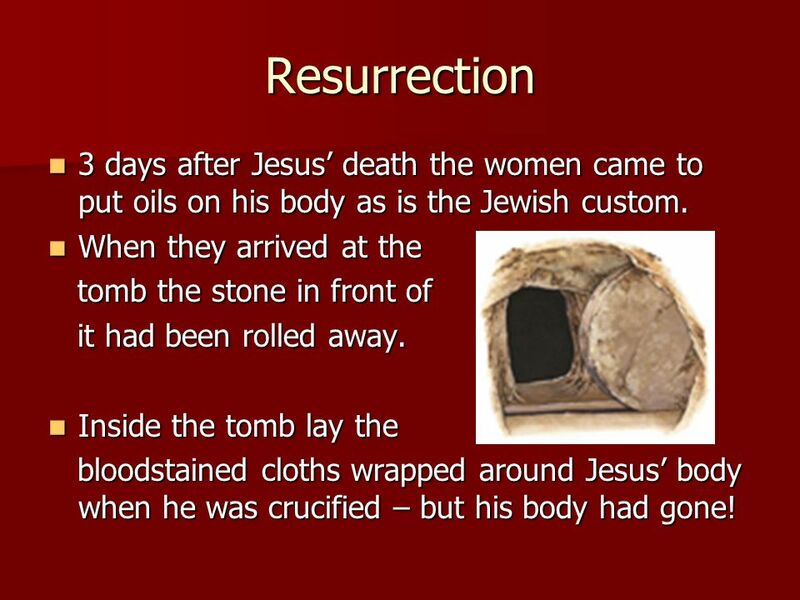 24 Resurrection 3 days after Jesus’ death the women came to put oils on his body as is the Jewish custom. When they arrived at the tomb the stone in front of it had been rolled away. 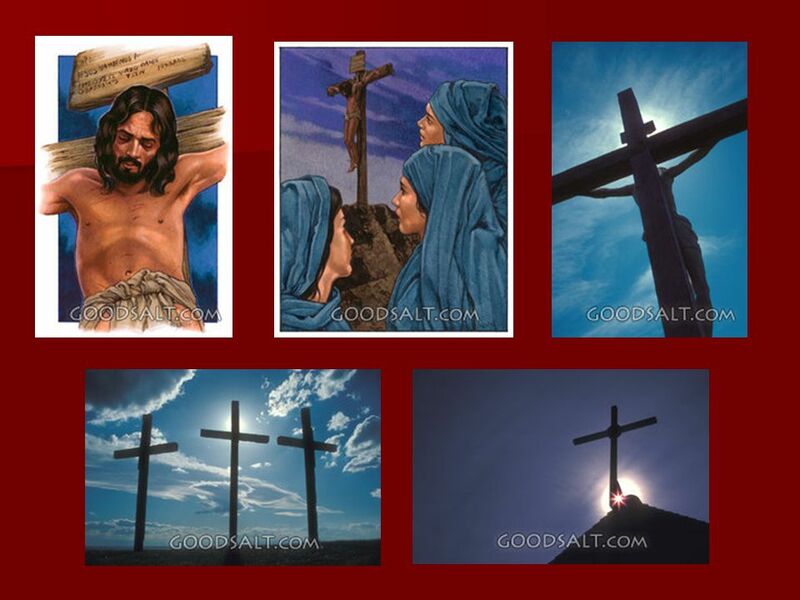 Inside the tomb lay the bloodstained cloths wrapped around Jesus’ body when he was crucified – but his body had gone! 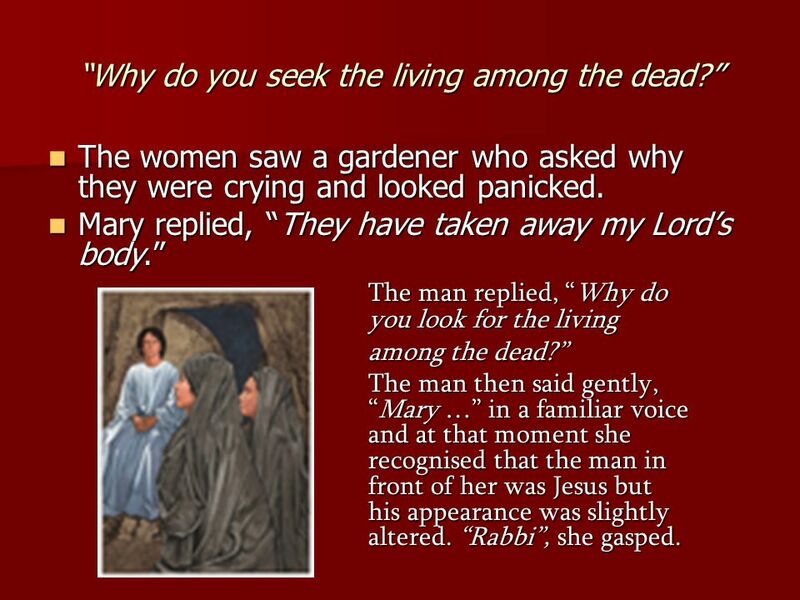 26 “Why do you seek the living among the dead?” The women saw a gardener who asked why they were crying and looked panicked. The women saw a gardener who asked why they were crying and looked panicked. Mary replied, “They have taken away my Lord’s body.” Mary replied, “They have taken away my Lord’s body.” The man replied, “Why do you look for the living among the dead?” among the dead?” The man then said gently, “Mary …” in a familiar voice and at that moment she recognised that the man in front of her was Jesus but his appearance was slightly altered. “Rabbi”, she gasped. 27 He said to Mary, “You cannot touch me yet because I haven’t yet ascended… but tell the others what you have seen.” He said to Mary, “You cannot touch me yet because I haven’t yet ascended… but tell the others what you have seen.” Meanwhile the disciples were walking along the road to Emmaus when a stranger joined them on the road. He could see that they were sad and asked what they were speaking of. 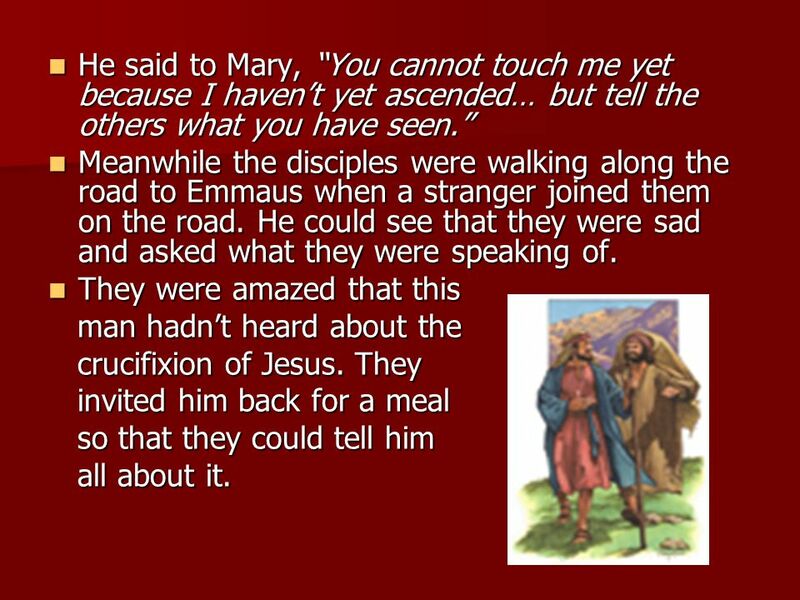 Meanwhile the disciples were walking along the road to Emmaus when a stranger joined them on the road. He could see that they were sad and asked what they were speaking of. They were amazed that this They were amazed that this man hadn’t heard about the man hadn’t heard about the crucifixion of Jesus. 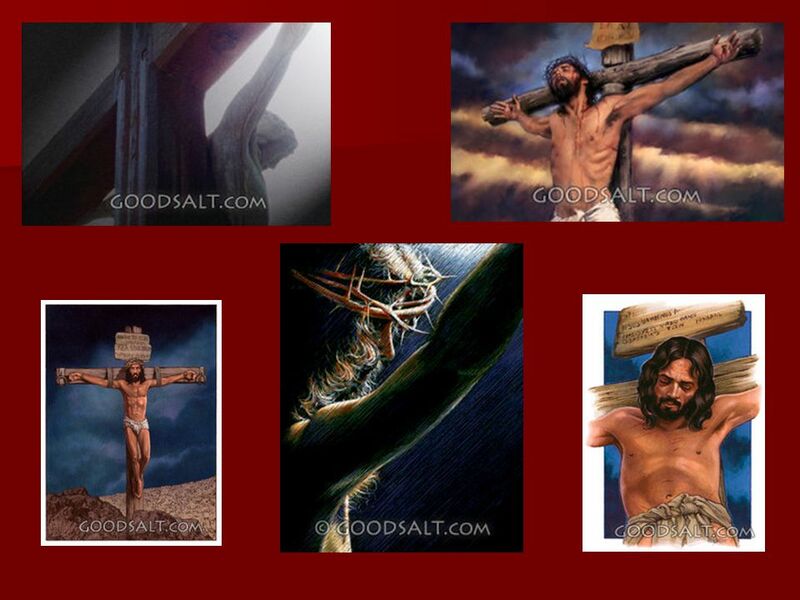 They crucifixion of Jesus. They invited him back for a meal invited him back for a meal so that they could tell him so that they could tell him all about it. all about it. 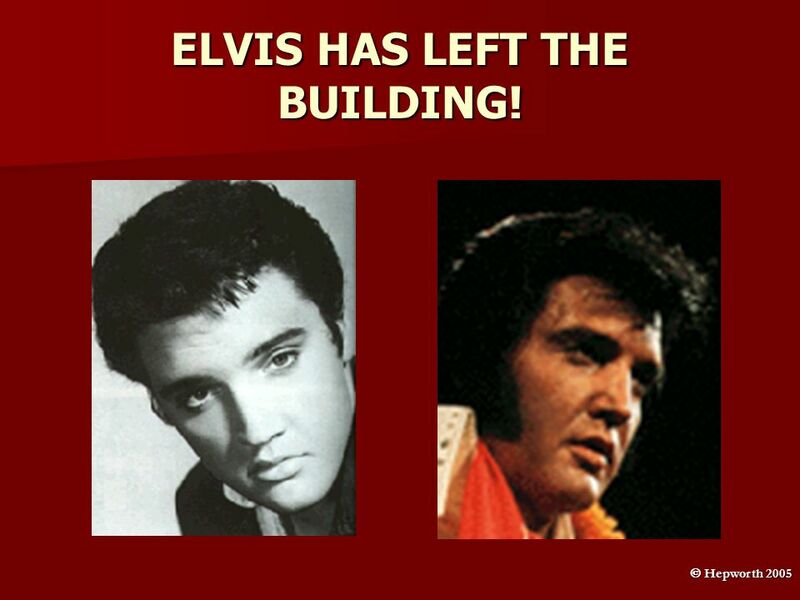 Download ppt "ELVIS HAS LEFT THE BUILDING!  Hepworth 2005. Is death the end? 'Man is mortal and death is the end'. All people die – this is the law of nature. Known." 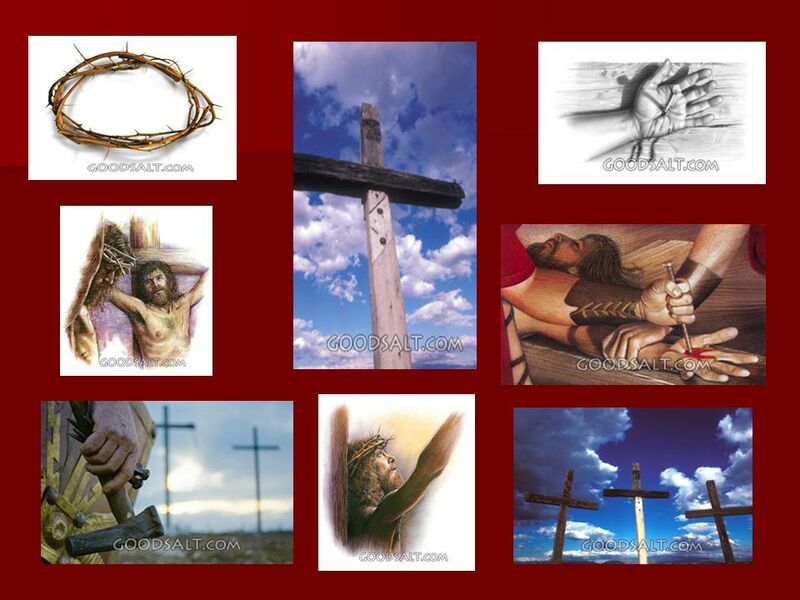 Prayer Service Season of Easter Resurrection Theme The Easter Season begins during the Easter vigil Mass and ends on Pentecost Sunday. Ebenezer Church On the first day of the week, very early in the morning, the women took the spices they had prepared and went to. Breaking Bread at Emmaus Luke 24:13-35 Message 8 in our 9-part series called Table Talk with Jesus. Sunday, August 25, 2013 Speaker: Dr. David Dawson. Journey to the Empty Tomb An Experiential Easter Service. For God so loved the world that he gave his only Son So that whoever believes in him Should not die but have eternal life L is for Love that he has for. Caring About Jesus John 20: Reaching the borrowed tomb where Jesus had been buried after He died John 20 1 Now on the first day of the week Mary. 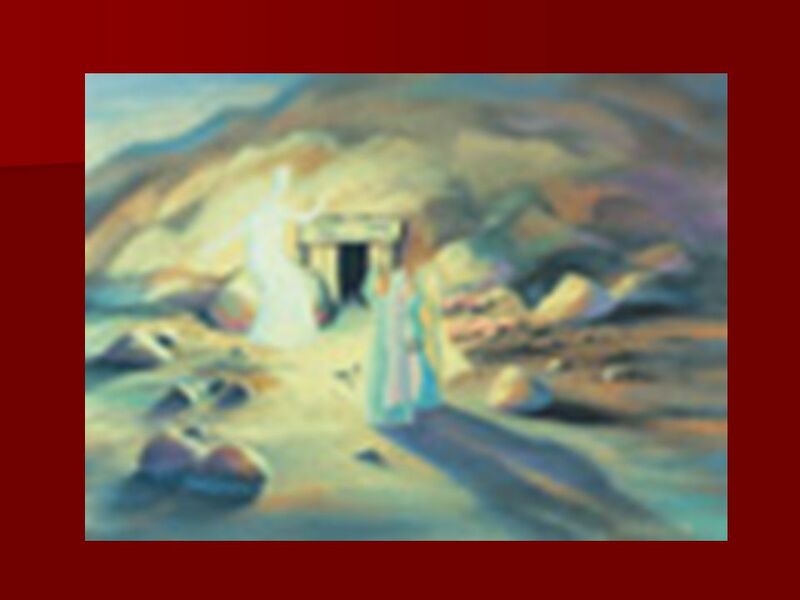 Encountering Jesus John 20: Early on the first day of the week, while it was still dark, Mary Magdalene went to the tomb and saw that the stone. The Empty Tomb The Empty Life - The Empty Marriage The Empty Checkbook - The Empty Earth. Jesus is Risen! Easter January 29, 2015. Stand in front of the if the sentence tells about an event THAT HAPPENED in the story of Jesus’ resurrection.